I-15; Add Auxiliary Lane, Davis Co. The SUE Solution’s team successfully completed the utility research, mapping, and inventory of this auxiliary lane project located in Davis County. The project limits began at SR-103 (650 North Exit, NB) in Clearfield, and ended at the SR-97 (5600 South Exit, NB) in Roy, Utah. SUE activities included Quality Level ‘B’ (horizontal designating) and Quality Level ‘A’ (vertical test holes). 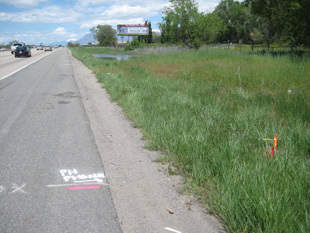 Quality Level ‘B’ designating and locating services incorporated Quality Levels ‘D’ and ‘C’ work which included Utility Owners map research, coordination with the existing utility owners and locating Contractor (Blue Stakes), the horizontal locating (QL-B) of the existing utility crossings (crossing I-15; the utility crossings located were determined by UDOT Region One), survey of the QL-B designated locations, and the production of Quality Level B mapping as part of the final report. 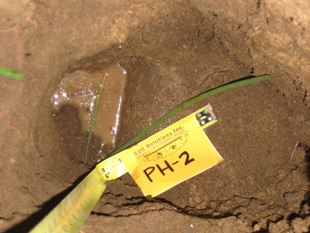 The Quality Level ‘A’ potholing services were performed at critical conflict areas within the project. The utility designating services were completed in August 5, 2011. Approximately 900 feet of Level ‘B’ designated utilities were located, surveyed, and mapped throughout the project corridor, with an additional twelve (12) test holes being performed. Utility coordination efforts with existing utility owners, and local utility locating contractors also took place to account for those utilities that were not locatable by conventional means. In addition, extensive coordination took place with Roy City Water, Weber Basin Water District and other utility owners.. A comprehensive final SUE report was produced as a deliverable which contained utility (QL-B) mapping exhibits, photographic documentation, informational data sheets for the sewer and storm drain systems, survey data, and Utility Owners existing mapping.